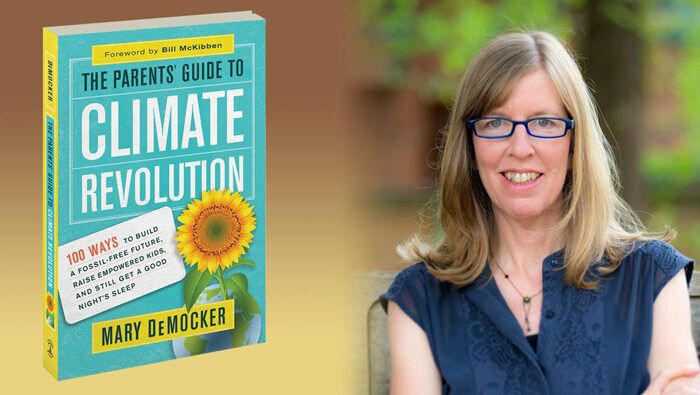 Author Mary DeMocker, co-founder of 350.org‘s Eugene chapter, shares humorous stories from her 21 years of trying to raise happy, well-adjusted kids while also protecting their habitat. Meet others ready to change our system–not just our light bulbs–and leave with at least 5 easy, family-tested ways to deepen family bonds as we fight for a livable planet. Stop by before or after the reading to say hi, check out her book, or have it signed—or come for the reading, 7:30 – 8:10 pm. Join the party! Tsunami Books lives at 2585 Willamette St, Eugene. Six local non-profits will be on hand to help families plug into local efforts at creating a fossil-free future, including Our Children’s Trust, 350 Eugene, Nearby Nature, U of O Climate Justice League, and Partners for Sustainable Schools. 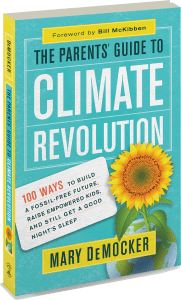 This book is a lively, empowering, and do-able blueprint for engaging families in the urgent endeavor of climate revolution. In the brief, action-packed chapters, you’ll learn hundreds of wide-ranging ideas for being part of the revolution — from embracing simplicity parenting, to freeing yourself from dead-end science debates, to teaching kids about the power of creative protest, to changing your lifestyle in ways that deepen family bonds, improve moods, and reduce your impact on the Earth. Engaging and creative, this vital resource is for everyone who wants to act effectively—and empower young people to do the same.